Anyways, it has made blogging difficult. I can never seem to schedule things enough ahead. The next thing I wanted to talk about was continuing to build on Zero to Hero. You may recall that the event challenge is over, and I figured I had done most of the challenges– even if I only had entries for about half of them. I was still considering using an editorial calendar (Day 29), to give you all an idea of what to look forward to. This page will be temporarily removed as of March 1 while we revamp the course. If you’re working your way through the tasks, feel free to paste the content into a file on your computer for ongoing reference after March 1. Interesting. I wonder how WordPress will revamp things. I haven’t decided yet if I’ll try to meet the Day 29 challenge, to use an editorial calendar. It’s tempting to just wait and see how they develop “the course” further. Categories: blogging, My Health, The Personal Journey, Zero to Hero WordPress challenge | Tags: a hero's journey, blogging, The Inner Journey, wordpress, zero to hero | Permalink. Zero to Hero officially ended when the month of January did. I was late in getting started, and I just had too much difficulty churning out a post every day (there were thirty days in the challenge). 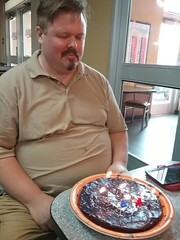 I posted when it felt right, and sometimes I decided to do maybe a little more than was asked for, especially if I wasn’t satisfied with previous results. 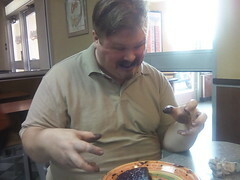 And then there were days where I just totally stalled out. Just to summarize (if you’re too pressed for time to click to see the images full-size), the 3-question survey asked if Zero to Hero worked well for me, while the 10-question survey asked for more specific feedback (say, if WP did this challenge again in the future). I just wanted to give you a quick note of thanks for this Zero to Hero challenge, and for many engaging Daily Writing/Photo challenges. I was especially inspired by your Cambodian prison photo for the Juxtaposition photo challenge… it looked a lot like a photo my daughter took when she was getting started in photography. Aw, thanks so much for the note! I’m glad you enjoyed Zero to Hero, and that The Daily Post is helpful. I’ll keep working on Zero to Hero challenge elements, but I’ll devote a little more time to some other projects that are still kicking around my brain. It’ll be a shifting gears of sorts. What all that might be… well, you’ll just have to stay tuned, and see! Categories: blogging, Zero to Hero WordPress challenge | Tags: Hero, jaklumen, Joseph Campbell, michelle w, The Hero's Journey: Joseph Campbell on His Life and Work: The World of Joseph Campbell, wordpress, zero to hero, zero to hero blogger, zerotohero | Permalink. 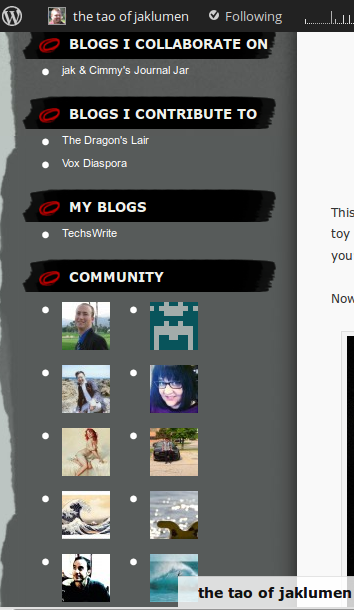 I’m skipping around a little bit, because I wanted to focus more deeply on how this blog looks. 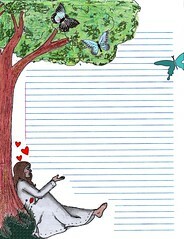 Assignment for Day 13 is to create, edit, or expand a blogroll. This was a challenge I agonized over for over a week. If you remember Hero pulls a zero on Blogroll challenge so far, I mentioned two parts that I intended to focus on. The first part was to promote the blogs I work on. Links widget and the Community widget, the latter which I’ll get to in a moment. but it just wasn’t very easy to read. This theme has rather tiny fonts for text on the sidebar. Vox Diaspora doesn’t have any custom design, so I made an image. I admit that I went rather lazy with the second part of my solution to the challenge, which was to show some of the blogs I follow. I guess I think the Community widget is a rather clean solution– it doesn’t show all blogs followed, but shows a random collection. I chose the “a few” option on how many users to show, which returns about 10 users for me. I’ve seen this widget before, and although I’m not FULLY happy with it, it will do, for now. The assignment for Day 15 is to open the Customizer and try out some new fonts and colors (and backgrounds and/or headers, if you’re still undecided). Unfortunately, this theme (Greyzed) does not come with customization options. I did experiment with fonts on the last theme (Superhero). But I did choose Greyzed because a lot of the color schemes were very similar, with a much cleaner look. But I did have to experiment with fonts while working on the image widgets for the blogroll challenge. This fulfills the title of Day 15’s challenge: to learn more about how visuals influence content. I would be remiss if I did not give proper credit where credit is due, to one who is Aussome. Aussa Lorens understands very well how visuals influence content. (I have to be honest here, Aussa, it IS well designed.) Cimmorene noticed this as well in Zero to Hero Day 25: Adapt a Custom Detail For Your Blog, which brings us to Day 25. 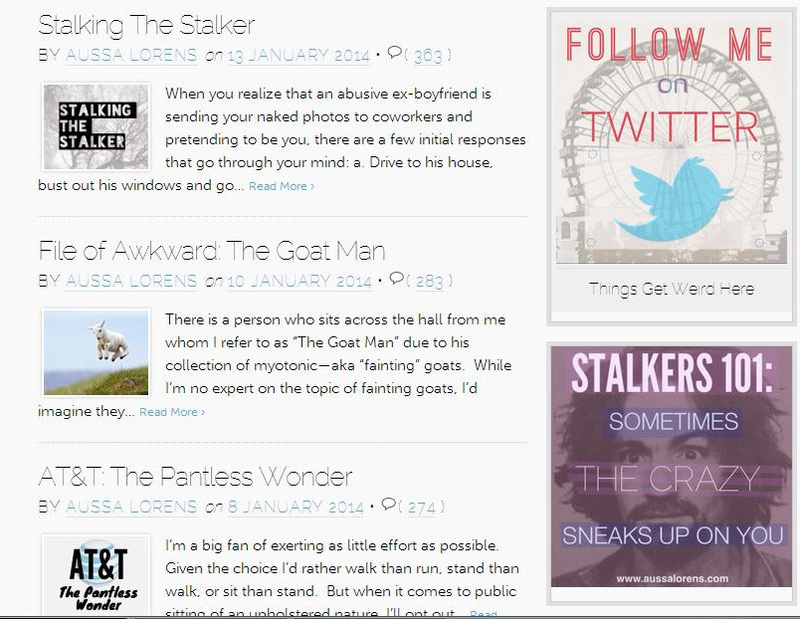 The day 25 assignment is to browse the blogs you follow and note a custom touch you love. Tell the blogger you love it, and interpret it for your own blog. Just had to adjust the width to 250 pixels, and it was good to go. Day 13: Building my blogroll – say what? Categories: blogging, Cimmy's Blogs, Posts from the WP Community, Zero to Hero WordPress challenge | Permalink. 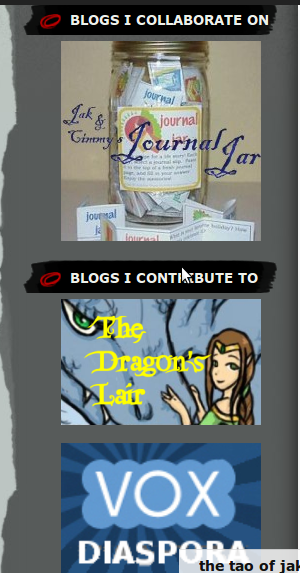 Today I’m guest posting at Cimmy’s blog The Dragon’s Lair to help with a Zero to Hero challenge. Comments are closed at the tao of jaklumen… come and give Cimmorene your support! I can’t believe there were no suggestions at all. Wait a minute, what’s this? You got it. Take it away, jak! The assignment for day 28 is to find the post that has received the most views, likes, or comments, and write a related follow-up post. Cimmy taught me to love myself more, and to smile more often. Categories: blogging, Cimmy's Blogs, Posts from Cimmy's blogs, Reblogs, Zero to Hero WordPress challenge | Tags: cimmorene, Cimmy, Dragon's Lair, reblog, zero to hero, zerotohero | Permalink. The assignment for Day 13 is to create, edit, or expand a blogroll. I have to admit, this challenge has got me stumped and stalled cold. There’s a number of ways this challenge could be interpreted. I have two solutions that I’m intending to move forward with. The first part is to build something that will promote the other blogs I work on, especially the one that I work on with Cimmorene. The second part is to build something more in the vein of what I’ve noticed a blogroll to be. Categories: blogging, Zero to Hero WordPress challenge | Tags: Blog, blogroll, wordpress, zero to hero, zerotohero | Permalink. Day 9 assignment: Follow five more blogs and/or topics. Day 10 assignment: add and customize two widgets. Day 11 assignment: leave comments on at least three blogs that you’ve never commented on before. Day 12 assignment: write a post that builds on one of the comments you left yesterday. Don’t forget to link to the other blog! Now normally, I wouldn’t try to blow through four challenges like this. I’ve got a ways to go to catch up, actually; the challenge is currently on Day 21. But I had to reiterate just how much Come for Company (C4C) is blowin’ up my blog, as well as continually prompting me to do stuff that easily aces all of these challenges. It started with rarasaur’s Come on, baby, spend Christmas with me! 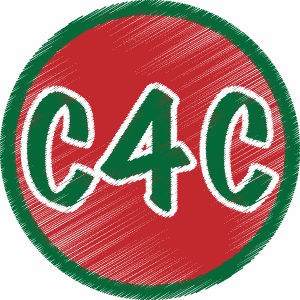 At the time, C4C was known as “Come For Christmas”. RuleofStupid gave instructions on how to set up a widget with the badge he designed for the site. You can’t see it now, because I have it set to Inactive. And even though he expanded his idea to cover other holidays as well as Christmas, no, I won’t count this widget twice. The next holiday was New Year’s, so, I wrote C4C For New Year’s? It’s On Like Donkey Kong! and yes, I have left comments on EACH and EVERY single one of those blogs. Some more than one. Some I am slowly catching up to. Yes, I am following all of them. So that’s Day 9 and Day 11 challenges down. Calamity Rae asked for a Follow Blog widget specifically. I’d never really thought that following by e-mail would be necessary, except, well, I think it was when she just had a self-hosted blog at the time. Then I decided it’d be more efficient to combine that widget with the widget I made for Zero to Hero Day 2: What’s this blog about, anyways? Or rather, I decided to take the text of that widget I made for the Day 2 Challenge and put it into the Follow Blog widget. That’s not counting other widgets that I already added to this blog when I started, like the Flickr one. 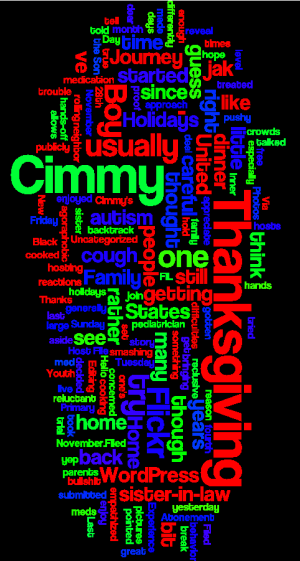 Or the image widget I had when speaker7 mentioned Wordle. And that’s not counting the widgets I marked inactive as they didn’t fit with the new theme I picked for Starting the transformation (Zero to Hero Day 5). That’s Day 10 challenge down several times over. I’m not sure if I left a post on The Matticus Kingdom before, but when I read The Return of the Official Matticus Kingdom Tug-of-War, I just KNEW I had to get involved and declare my support for Marvel Comics. I mean, c’mon… I have an ENTIRE category posts regarding The Silver Surfer and how the story of his journey from Norrin Radd to Herald of Galactus and his meeting with the Fantastic Four follows the Hero’s Journey TWICE OVER. (And I haven’t even gotten to the Infinity Gauntlet series that crossed over all Marvel comics, let alone that featured Surfer very prominently!) I have blogged about The Silver Surfer consistently, from LiveJournal, to VOX, to WordPress. So that’s Day 12 Challenge down, at least in part. But I’m sure I’ve done the Day 12 challenge several times– one of the finer points in blogging etiquette that I learned from liliales when I was at VOX– if I make a comment that gets too long on another blog, it’s usually best to make a post on my own blog about it (and link back). While I’ve met a few bloggers that are okay with long comments, I have read a few posts that I figured it would be good to write my own post in response. And then there are a few posts that inspired me to dig down into my archive (both of VOX, and of WordPress, which is all here). And I’ve done a LOT of that lately, actually. Categories: blogging, Holidays, jak's archive, Posts from the WP Community, The Silver Surfer, Zero to Hero WordPress challenge | Tags: christmas, flickr, matticus kingdom tug-of-war, New Year, Team Marvel, valentine's day, zero to hero, zero to hero blogger, zerotohero | Permalink. The assignment for Day 8 is to create an About page, or revisit and improve the one you have. First, I decided to hide all but one of the existing Pages I had written. Two were about other blogs I work on. I think promoting them will be covered better in a later challenge: Day Thirteen: Build a (Better) Blogroll. One was about the last blogging platform I wrote at, and another blog that I contribute to for other bloggers that used that blogging platform, too. 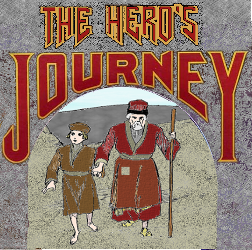 The other three were all about this blog here, so it made sense to unite them into one: About the tao of jaklumen and the Hero’s Journey. That page wasn’t easy to write– I decided to put up links to categories of blog posts I was especially pleased with. But WordPress starts the Categories page with the newest post, ending with the oldest– and for categories having to do with the Hero’s Journey, it would be like reading a story backwards. So for the Equilibrium and Silver Surfer categories, I had to sort through every post and include a link at the bottom indicating which post was next in the series. I also used an image and a text link to each category. It was hard to line up each image to each text link correctly. It’s finally done… for now. I had to revise things over 25 times. I hope it’s worth it! The Silver Surfer series will have some additions to it, but I need to get a copy of the Infinity Gauntlet graphic novel first. Categories: blogging, Zero to Hero WordPress challenge | Tags: about page, Blog, heros journey, Monomyth, norrin radd, Silver Surfer, tao, wordpress, zero to hero, zero to hero blogger, zerotohero | Permalink.